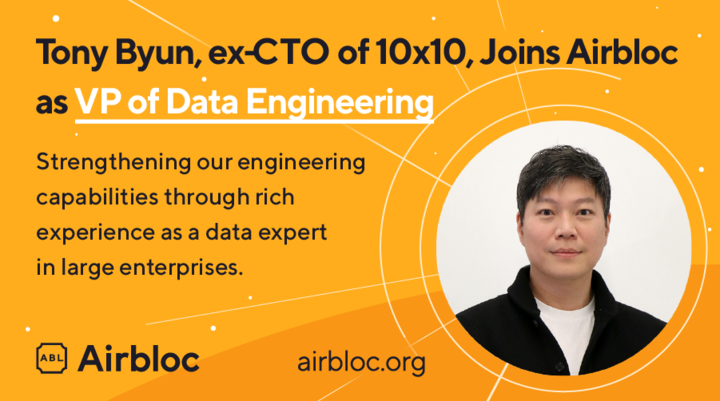 To engineer more enterprise-level data exchange use-cases, Airbloc, a consent-based real-time data exchange platform, has hired Tony Byun, the ex-CTO of 10x10 as the new VP of Data Engineering. Tony’s illustrious career spanning several years as a data expert can be seen by his past work experience as CTO of 10x10 (TenbyTen), a prominent brand in Korea with more than 3.5 million customers on their e-commerce platform and offline stores. He also brings his rich experience as an Engineering Team Leader in Netmarble, the No.1 online game publisher in Korea that developed games familiar to us such as Lineage Revolution. In order to realize Airbloc’s vision of maximizing business performance through data exchange, it is important for senior data experts with experience working in large enterprises to join the ranks of our company. Below is an interview we conducted with Tony Byun. Enjoy! Please share with us your background before joining our company. I worked as a CTO of 10x10. 10x10 is a design-oriented e-commerce shopping mall with more than 3.5 million customers and more than 10,000 participating stores. As CTO, I was in charge of creating a data pipeline that helped 10x10 craft better data-driven business decisions and building an enterprise-wide business intelligence system (BI). Prior to 10x10, I was an Engineering Team Leader at Netmarble, №1 online game publisher in Korea which developed games such as Lineage Revolution. I was also a Platform Division Leader at NeoCyon, a company that provides global mobile gaming contents in 16 countries. I am curious as to how you served as a CTO at 10x10, and how you have achieved data-driven business success. Before I joined 10x10, there was no culture to craft business decisions based on data and it was inefficient to gather and analyze data through multiple channels. So I decided to build an internal Business Intelligence system and relied on the One Metric That Matters (OMTM) model, and searched deeply what needs improvement in the product / service based on consumer behavior data. I did various hypotheses and experiments by using a product backlog. Based on this, we structured our corporate culture to analyze customer behavior data in our products. For example, we increased customer engagement clicks on pop-up window notifications by up to 600%. Why did you decide to join our company? Data-friendly company. As a big data analysis company, all team members are dealing with data in great depth and detail. 85% of the team are made of developers, and they are technology-centric. I have been observing the company for a long time and I am confident that in this environment I will be able to help draw meaningful insights through data and help many partners based on these data driven insights. Unique technology. The fact that we have the technology to track data from 40 million mobile devices attracted me. It’s a competitive service in Korea that can collect, integrate, and analyze both website and application data. Please explain what role will you take. Each company we work with has its own business goals, pain points, and KPIs. Through our proprietary data collection, analysis services and data exchange platform, companies can collect, process, and analyze data that is meaningful to them and ultimately succeed. I will actively help with whatever expertise and experience I have. Do you have any goals you’d like to achieve in this company? Making data-driven decisions and making product improvements through data analysis is a challenge, but at the same time, it brings tremendous joy and energy for me. I want to spread the word about the importance of data collection, analysis and utilization based on my experiences. What qualities or attitudes do you need to be an expert in data? First and foremost, it is important to try a variety of experiments to make meaningful results with large amounts of data. But the data does not tell you everything. Sometimes it means that even if you look at good data and make a hypothesis, you can fail. Because there are so many external variables. In other words, for variables that we can not control, we need insights from people, not data. Ultimately, people with expertise in data are those who can think of multiple factors together and combine their insights into their data. And until you have the experience and know-how to generate insights, you have to endlessly fail and enjoy failing. If you are afraid of failure, you should discard the idea of ​​handling the data. I’m sure there will also be colleagues and bosses who have a negative attitude saying, ‘Is that supposed to be true?’ You have to be able to overcome this stigma. “I think data is the foundation of decision making that helps companies develop products in the right direction.” In most existing companies, decisions have changed from time to time depending on the company’s position for sales, marketing, or the intentions of the product planner. However, when we collect and analyze customer behavior data, we can start making various product decisions based on these customer data. With Tony’s rich experience and know-how, Airbloc will be able to find meaningful data indicators in data transactions and further enhance the value of personal data exchange. This is a big stepping stone for Airbloc to become a service that will eventually be adopted by enterprises. Airbloc is a consent-based real time data exchange platform. A project that aims to realize true enterprise adoption, it has lined up large enterprises who will use its data infrastructure. For its promising technology, Airbloc gained funding support by renowned traditional and blockchain institutions such as LINE Corporation’s Blockchain Venture Fund, Huobi Capital, and OKEX Capital, Bgogo, Fenbushi Digital, and many more.